Kids from Doncaster and Barnsley came together to partake in a Premier League Kicks mini-tournament before the Barnsley FC versus Doncaster Rovers game on Saturday. 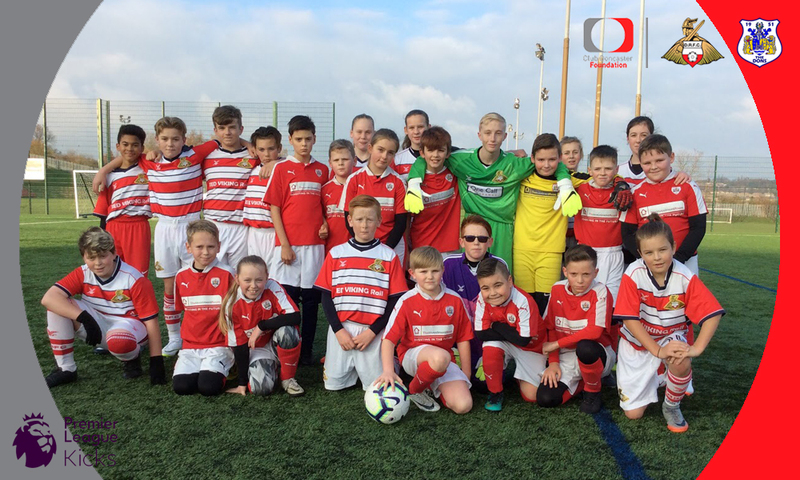 Club Doncaster Foundation took a number of kids from its Premier League Kicks programme down to Oakwell to watch the EFL League One encounter, taking part in a small tournament between Doncaster Kicks and Barnsley Kicks beforehand. Consisting of four teams, two from each club, the tournament saw each team face the other sides once, celebrating with a team photo at the end, before heading over to watch the match afterwards. The games were played in true sporting fashion, as all teams showed good footballing skills throughout. One Doncaster and one Barnsley team went unbeaten throughout the tournament, winning two games and drawing against each other. Foundation community coach, Sean Fearn commented: “It was a great opportunity for the kids from our kicks sessions around Doncaster. “They have never played together before and for some of them it’s the first ever time they’ve met so to see them all interacting together and playing well as a team is fantastic!